To facilitate availability of items needed for Subcutaneous Desferal Therapy, the Society purchases the following items in bulk - syringes, needles, scalp vein sets, distilled water, Emla cream, Tagadem, micropore etc. Members can buy them at cost or subsidized rate. 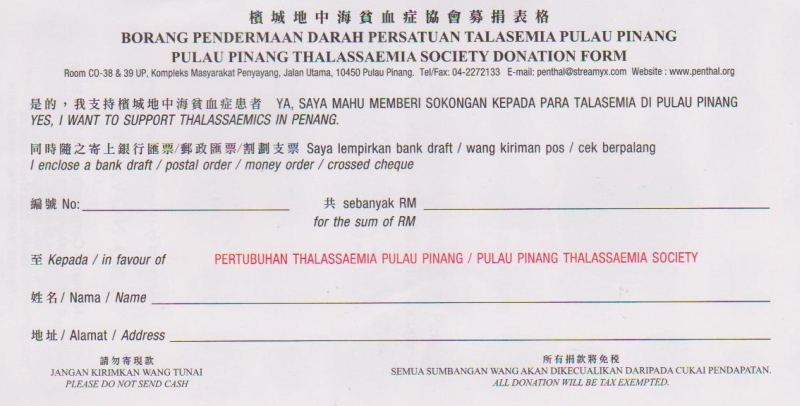 The Society actively canvasses for blood donation to ensure Thalassaemics in Penang have adequate blood for transfusions on a regular basis. Blood donors are given certificates as well as a small token of appreciation. Interested please email penthal88@yahoo.com or call us. The Society organizes motivational camps for Thalassaemics , affected families and personnels involved in the care and management of Thalassaemia. Programmes include self management , monitoring and psychosocial aspects.Such camps bring together patients, families and well-wishers to exchange ideas and information. Counselling sessions are conducted by guest speakers to patients, families and carriers. The Society collaborates with the Paediatric,Haemotology units of Penang General Hospital , Seberang Jaya Hospital , other Thalassaemia societies of Malaysia to organize workshops and conferences. Experts in the field of Thalassaemia are invited as guest speakers local or from abroad. Society also sponsors our local doctors , patients and paramedical staff to international conferences to keep abreast with the latest development and advances in the management of Thalassaemics. Society also disseminates relevant medical and non medical info to members, interested parties through our own newsletter ( THALWATCH ), videos, booklets and pamphlets. Through these programs , we hope to educate the public on the management of problems of Thalassaemia. The Society helps to furnish the daycare centers with TVs , sofas ,etc so that the Thalassaemics can have their blood transfusion in a comfortable environment on an outpatient basis. Society raises, by any legal means, the funds required for the above activities. We welcome donations of old newspapers, magazines, clothings which can be sold for recycling. This is one of our source of sustained income. Collection Centre at Society office or tel 04- 2272133 ( office hours only, closed Sat and Sun). The Society is fully dependent on public donations for financing its many activities and treatment subsidies. All cash donations to the Society are tax-exempted.